What we call the chamomile’s flower in everyday language is botanically a composite inflorescence. 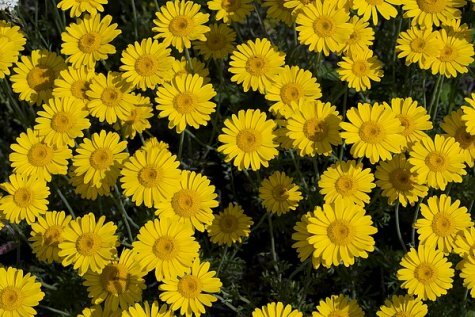 It is composed of two different florets: the yellow disc florets in the centre, surrounded by the long, flat ray florets. It is a perennial with a strong, hairy stem and leaves that resemble the leaves of milfoil (Achillea millefolium). Yellow chamomile is associated with human cultivation; it is seldom found in pristine nature but always in the tracks of human activities – on roadsides, in gravel pits, fallow land, as a field weed ... Its seed need open soil to germinate and can’t tolerate competition form other close-growing plants. The yellow chamomile has probably arrived in Estonia from the south along with cultivation of cereals, thus hundreds of years ago, and so it isn’t reagrded as an invasive alien species.